We have just returned from an ambitious 9 days of spirits tasting which included two major cityies, eight French producers, three distributors and a hurricane. So we are happy to report that in addition to surviving a grueling work schedule, we managed to connect with quite a few consumers and we also had a pretty good time. 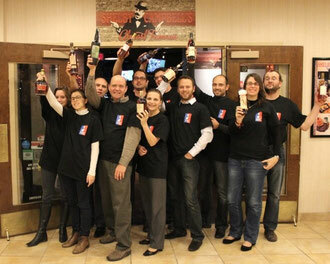 Our adventures began with a drive to New York to work at the New York Whisky Fest. This was a great opportunity to introduce the Armorik Whisky line, the only French made single malt available in the US to a dedicated group of consumers. It was a real pleasure to talk with individuals who were so well informed about whisky, many of them devout members of whisky clubs. The Wall Street Journal had impeccable timing by publishing "Eau de Malt," a full page article on Frenchwhiskys during the Festival. Started by a phone call we recieved over the summer, writer John Forsyth did an admiral job of sorting through the collection of emerging French producers dabbling in the production of whisky and rightfully singled out Armorik as the most developed and most scotch like of the group. While the emphasis of the piece was on French Whisky, the emerging catagory of "world whiskyies" was mentioned and several producers were discussed.